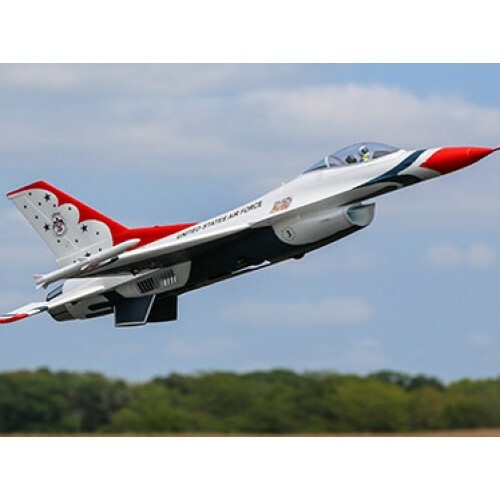 The General Dynamics/Lockheed Martin F-16 is one of the most recognised and successful single-engine fighters in the world. Its amazing performance and capabilities are why the world-renowned U.S. Air Force Thunderbirds demonstration team chooses to operate it with distinction at airshows around the globe. 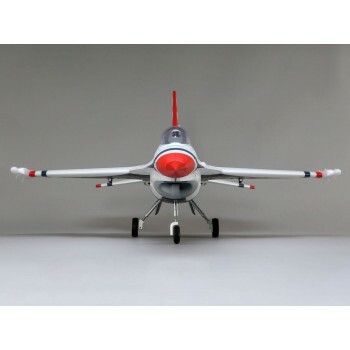 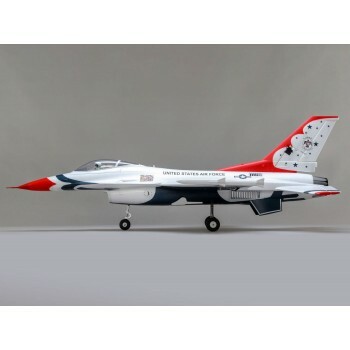 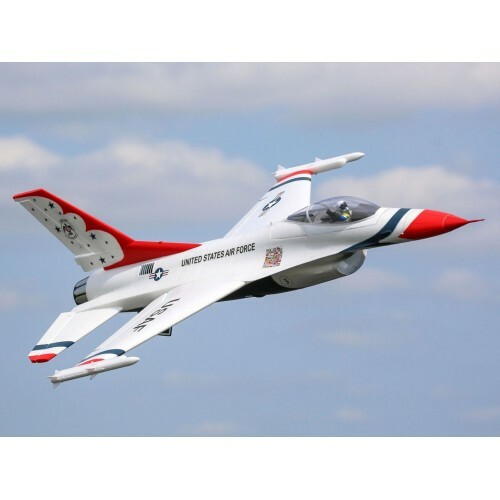 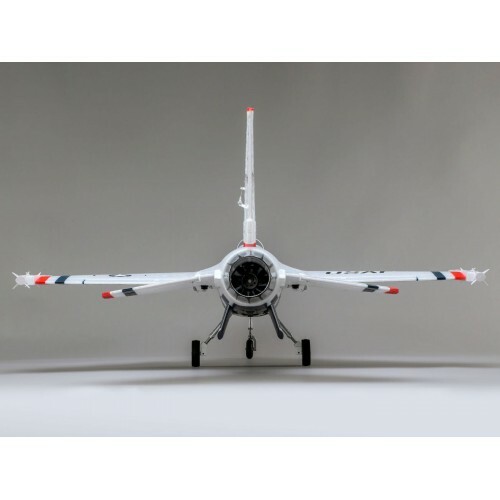 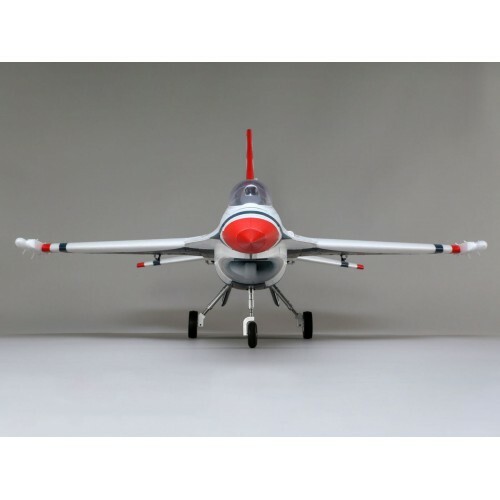 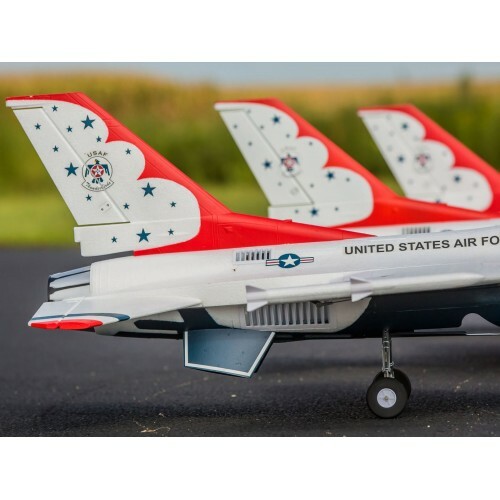 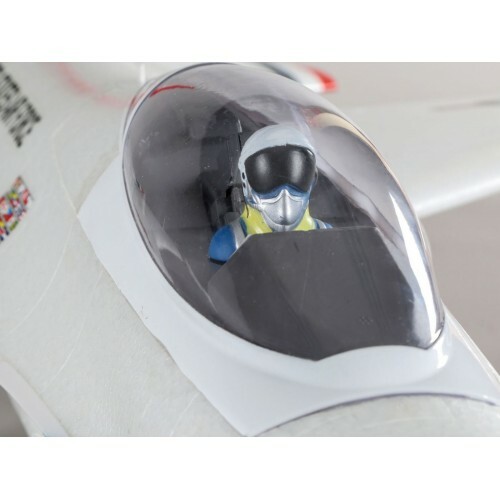 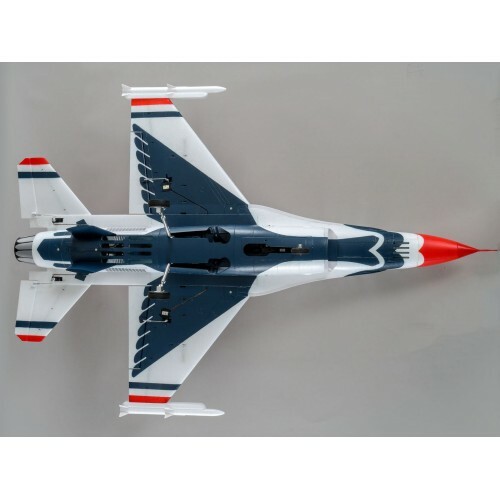 The E-flite® F-16 Thunderbirds 70mm EDF jet is a scale replica that delivers incredible performance while also being easy to fly when it's equipped with exclusive AS3X® and SAFE® Select technologies (included with BNF® Basic version only). 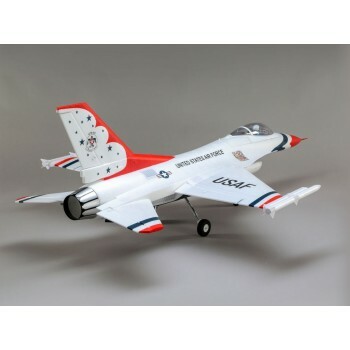 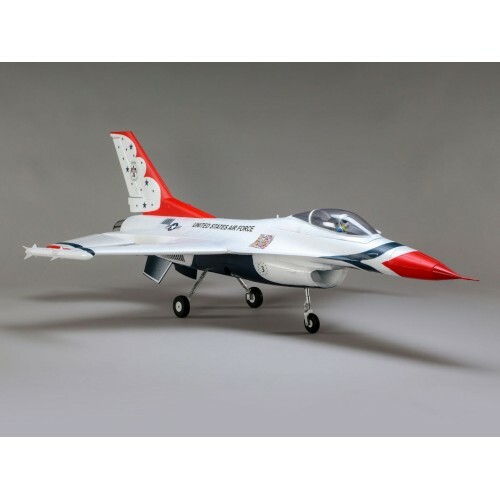 The E-flite F-16 Thunderbirds 70mm EDF jet is a replica of the iconic aircraft flown by the U.S. Air Force Thunderbirds. 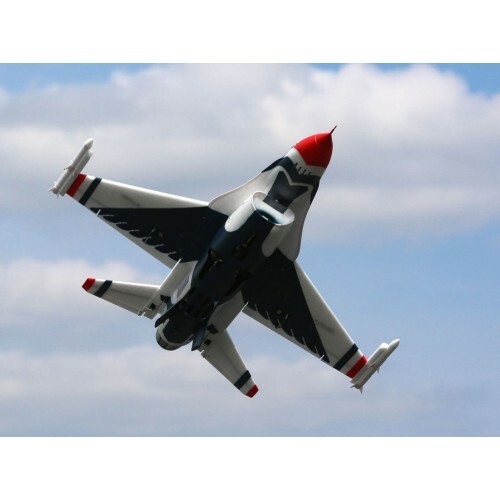 Like the full-scale airshow thriller, this F-16 has an incredibly wide flight performance envelope-from slow and stable high-alpha flight to amazing high-speed and vertical capabilities. 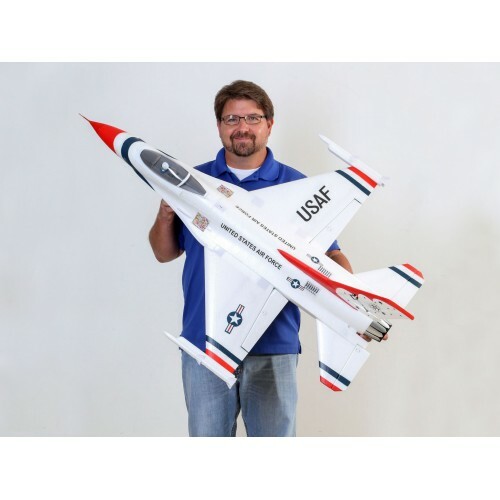 At its core is a 6S-compatible brushless motor and a 70-amp ESC that are matched to a 12-blade fan to deliver an abundance of speed, thrust and a turbine-like sound. 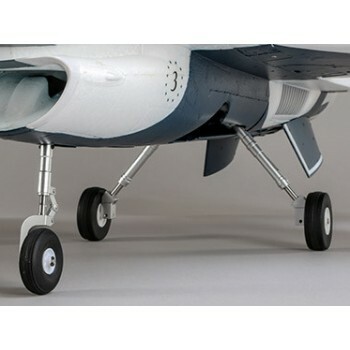 Factory-installed electric retracts with shock-absorbing struts make it possible to take off and land on a wider variety of surfaces-including grass-while keeping ground handling smooth and delivering a realistic jet experience. 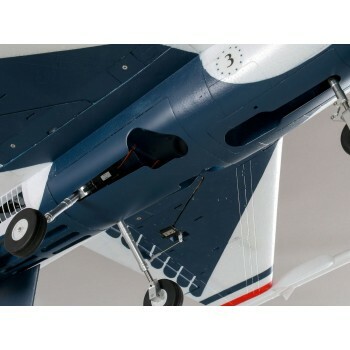 The composite reinforced EPO airframe is lightweight yet strong, and the digital, metal-geared servos plus ball-link equipped linkages provide precise control. 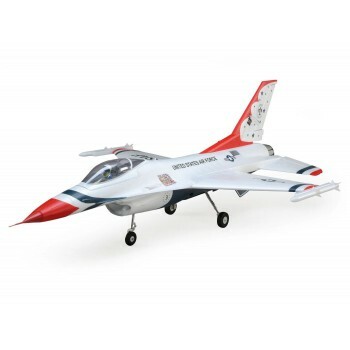 And it all combines to deliver one of the easiest to fly yet highest-performance and most capable F-16 models ever! The easiest to fly high-performance F-16 EDF (Electric Ducted Fan) jet model yet! 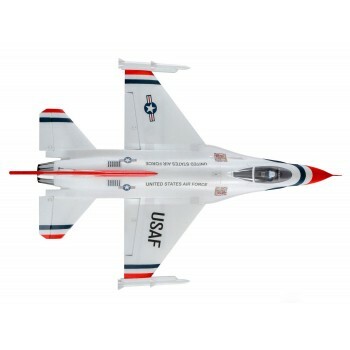 This is the first high-performance F-16 model equipped with exclusive Spektrum® AS3X® and SAFE® Select technologies. 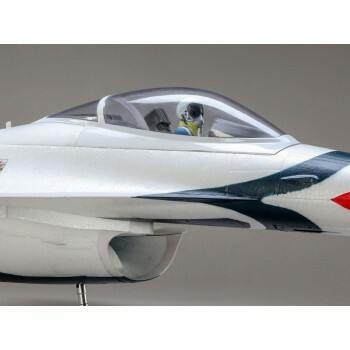 AS3X works behind the scenes to smooth out the effects of wind and turbulence to deliver a locked-in feel that makes it seem like you're flying a much larger jet. Optional-use SAFE Select offers pitch and bank angle limits along with automatic self-leveling that can be turned on and off at the flip of a switch making this the easiest to fly F-16 model yet! 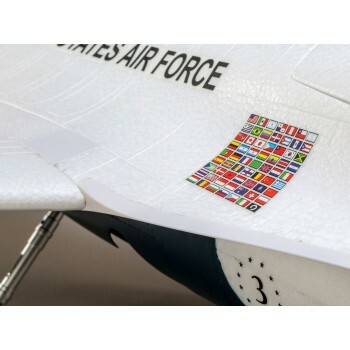 And if you don't want to enable the SAFE Select features, simply bind the receiver normally and only AS3X will be active. 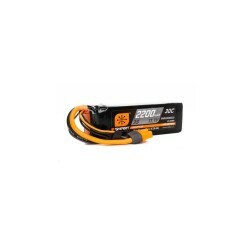 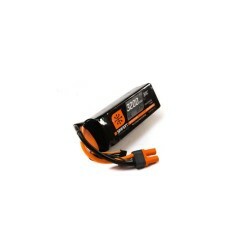 The 12-blade 70mm fan, high-RPM brushless inrunner motor and 70-amp ESC combine with your 6S 3200-4000mAh LiPo battery to deliver amazing vertical performance and an incredible speed range with virtually instantaneous throttle response. 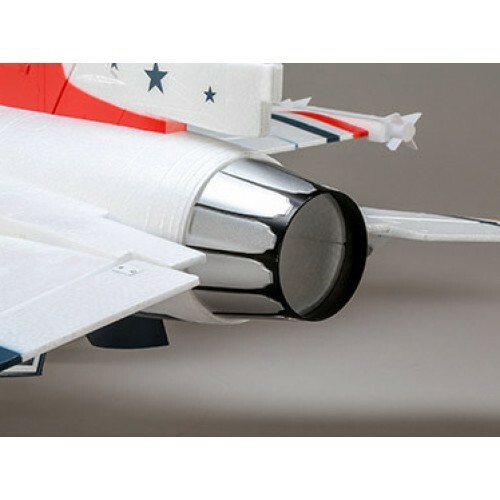 But what makes the experience truly rewarding is the fantastic sound produced by the power system-it's almost like a real turbine. The F-16's unique design offers incredible handling through a wide flight envelope and speed range. 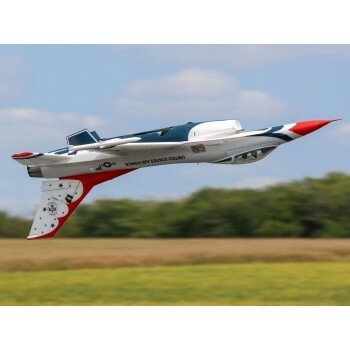 It's capable of rock-solid high-speed flight so you can perform locked-in low-level flybys and aerobatic manoeuvers including giant loops, point rolls and more, while also being capable of slowing down to deliver smooth and stable high-alpha flight and landings. 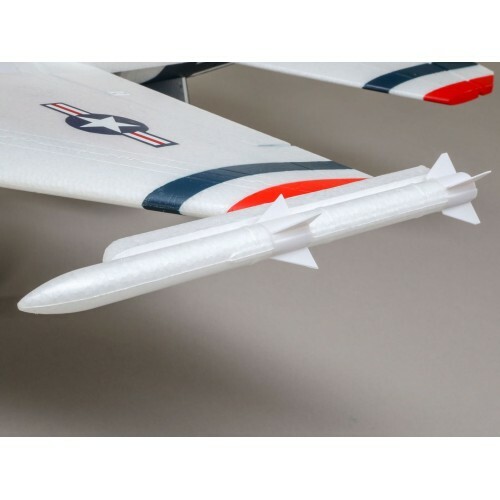 The airplane instantly returns to and holds level flight when the sticks are released and in the center position. It's also helpful for keeping the wings level during takeoffs and landings. The simple procedure for assigning a transmitter switch to turn SAFE Select features on and off doesn't require any programming and takes just a few seconds.If you don't want to enable the SAFE Select features, just bind the receiver normally and it will function like a standard AS3X receiver.